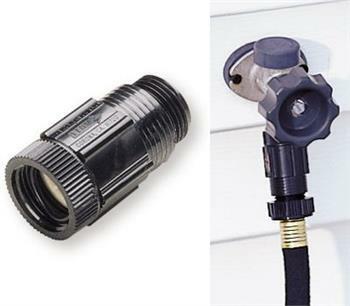 Use with all soaker hose watering systems and drip watering systems. Reduces and maintains faucet water pressure to 30 PSI. Recommended for use with Mr. Soaker Hose and Fiskars brands of soaker hoses. Meets warranty requirements for both Mr. Soaker Hose and Fiskars branded soaker hoses. Note: Fiskars brand includes Fiskars, Aquapore, Moisture Master and Better Homes and Gardens brands. Available individually or in cases of 8. Use with all soaker hose and drip systems. Reduces and maintains faucet water pressure to 30 PSI. Available individually or in cases of 8.